I'm so thankful that 2016 was full of amazing trips all over the world. I started the year in Asia, spent the spring in the Caribbean and Middle East, most of the summer in Europe, and returned to Asia in the fall. 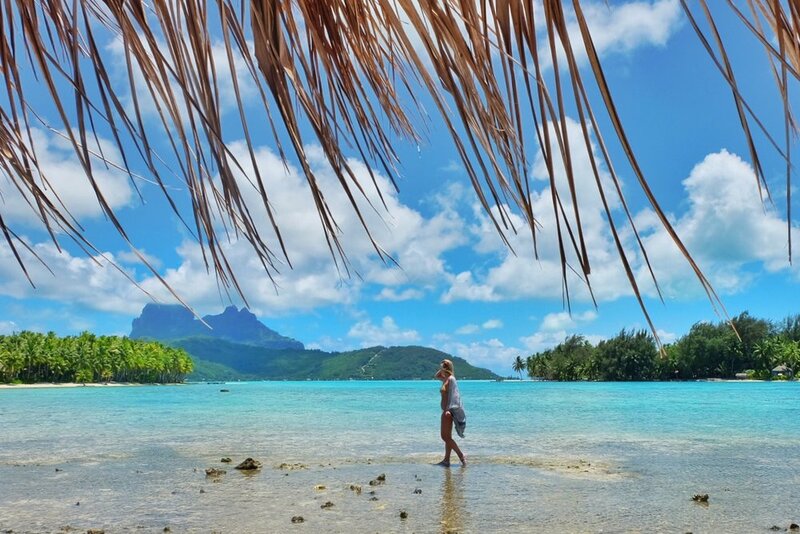 I ended the year in French Polynesia exploring the beautiful beaches in the sun! It's impossible to choose favorite places, so these are some of the coolest spots I saw this year and would recommend to anyone looking to travel in 2017. Ancient, charming, built on canals - Hoi An is the Venice of Vietnam. In the last six months I visited every major city in Vietnam and Hoi An was my personal favorite. The old town is a Unesco World Heritage Site made of narrow streets lined with colorful paper lanterns and overflowing flower boxes. A lot of the streets are closed to traffic, so it’s a rare place in Vietnam you can walk around without fear of getting hit by a motorbike! Because of it’s history as a trading port, the architecture is a mix of Buddhist temples, Japanese covered bridges, colonial shophouses, and several quaint museums. Hoi An also has no shortage of tiny, local restaurants where you can eat like an absolute king for about $10. The nearby ruins of My Son offer the perfect compliment to this charming place. Singapore feels like a deep-cleaned, PG-13 Las Vegas. It’s full of gleaming skyscrapers, modern hotels, and outposts from every major designer and chef in the world. Whether you’re having a Singapore Sling at Raffles, exploring the Gardens by the Bay, or taking in the view from the world’s most amazing rooftop pool at the Marina Bay Sands, you’re sure to feel pampered, relaxed, and in awe of the beauty and luxury. If you’re looking for a break from the glitz, nearby neighborhoods like Tiong Bahru offer some small, charming streets with cool coffee shops, incredible bakeries, and independent book stores. Much like Vegas, Singapore is a great place to spend a weekend or for a short stopover to break up a long flight abroad. Coconut Island. Need I say more? This beautiful little paradise off the coast of Thailand offers everything you want for a beach getaway: soft, white sand, crystal clear water, never ending sunshine, amazing food, and incredible value. We rented a private boat for the day to take us snorkeling for $15! When you’re ready for a break from the sun, you can get a 2 hour thai body massage (for under $10!) and snack on coconut ice cream, served in a coconut. This place is little slice of heaven and the perfect way to relax after exploring the hustle and bustle of Bangkok. My first trip to the Middle East was this year to the tiny nation of Bahrain. Thanks to my amazing local hosts, I got to explore the souk with a man whose family worked there for generations, eat a traditional Bahraini breakfast seated criss-crossed on the floor, and have a sunset tour of the Amer Fort. Following in the footsteps of nearby Dubai, Bahrain is exploding with construction, but there’s not nearly as much western influence. I got to visit the Bahrain national museum, and learn about their history and culture. What I really enjoyed about Bahrain was the lack of western tourism. Some of my favorite places to see are the one no one is going to yet, and that is definitely the case here. Hong Kong is a shopper and foodie paradise! I was surprised by the sheer size of the city, and most loved just getting lost in it. You’ll stumble upon massive night markets, the most instagrammable food in the world, and absolutely every store that exists on your journey. Just be prepared to hear “you want handbag, watches?” a million times as you walk down Nathan road. Or avoid the counterfeit goods and head to PMQ to find things from upcoming local designers. If you’re into crazy desserts, it’s worth a trip here alone just to satisfy your sweet tooth. I ate giant fresh-made egg waffles topped with ice cream and sprinkles, and mochi, and sauces, and flowers made of fresh whip cream! For a fan of Disney, Hong Kong Disneyland is a fantastic day trip, accessible by subway in under an hour. Mexico is not just for springbreakers! Cabo has a reputation as a party town, but just a fifteen minute drive from in famous Cabo Wabo are several secluded, beautiful resorts where you can have a stretch of beach and bowl of fresh guacamole all to yourself. I stayed at the Thompson Hotel - The Cape, and from their infinity pool, to their rooftop bar, to their life-changing french toast - it was one of the best beach getaways I’ve ever had. This is a great alternative to an all-inclusive cancun experience that can be a bit cheesy, and if you’re already on the West Coast, this paradise is just a short flight away. Norway was the highlight of my summer! Cruising the fjords, hiking through beautiful scenery, and endless amounts of fresh smoked salmon! I quickly found myself wishing I was Norwegian so I could call this incredible place home. Flam is a stop on the popular “Norway in a Nutshell” because of it’s undeniable charm and fantastic location at the foot of the naeroyfjord, ranked the most beautiful of all the fjords. This tiny charming town offers you a chance to see the beauty of Norway by sea and by land with a trip on an old cog train called the Flamsbana that winds through the mountains and brings you feet away from rushing waterfalls. Just be sure to pack your hiking boots and watch out for trolls! With stunning natural beauty and the dreamy Blue Lagoon, Reykjavik has become every adventurers go-to spot. My first trip there was this summer, and I found Iceland offers true experience into the wild: horseback riding, scuba diving, whale watching, 4-wheeling on glaciers, hiking inside volcanos and soaking in a hot spring. If you’re there in the winter you even get a chance to see the Northern Lights. There’s also a rich history to explore and some seriously cozy knit sweaters and fluffy furs. I had a great time touring Iceland with a modern-day viking named Eaglewolf that was 7’ tall and had better hair than me. Since Iceland is becoming a hotspot, I really enjoyed straying away from big tours and having locals take me around. Eaglewolf was a friend through magic, but now offers his own tours, so if you’re heading to Iceland there’s no better guide! DM me for details! This tiny Scottish Island is rich with history, natural beauty, and some seriously cute animals. Shetland ponies in fair isle sweaters dot the rolling, green hills of the countryside, and families of puffins hide out by seaside lighthouses. The town square is strung with colored bunting and full of yarn shops and frilly tea rooms serving homemade sticky toffee pud for those who want to shop and eat, while the ancient Viking ruins of Jarlshof will wow any adventurer! Because the Shetland Islands is sort of off the radar, we often felt like we had this island to ourselves during our visit. Tallinn is Europe’s best kept secret. This tiny town is drenched in charm and culture preserved by century-old walls that surround the Old City. In contrast, the grey, graffited outside is still full of the Soviet influence, but dotted with hipster cafes and indie shops. Restaurants serve up some of the most inventive and delicious nordic cuisine I’ve ever had - I ate chocolate covered moss and pumpkin pearls! The value in Tallinn, compared to the rest of Europe, was amazing. A truly luxury vacation is much more affordable here than the rest of Europe, so if you’re seeking fancy hotels and fine restaurants but you’re on a budget, this is the place to go. Stay in the Old City to really soak up the magic, because Tallinn makes for a fairytale weekend away. The perfect contrast to Tokyo’s modern skyscrapers and orderly chaos, Kyoto is rich with temples, sights, and shrines that will wow you. There’s an endless amount of things to go here - In one day you can walk through a mile high bamboo forest, find your zen at a Japanese rock garden, walk through hundreds of tori gates, and stand in awe of Golden Pavillion. Every corner of Kyoto is like a postcard, and you really get a feel for old Japan. It’s also an area famous for matcha - so if you’re a lover of green tea, prepare yourself for the best lattes, mochi and soft-serve of your life. I was averaging 2/cones a day! This island famous for its folklore is truly the stuff of dreams. Vibrantly turquoise water, lush, green mountains, pops of hot pink flowers- every vista looks photoshopped. And that’s just above ground! Below the water are neon creatures and rainbow-colored coral. This is not your average beach holiday - there are so many ways to see the islands - from 4x4s to snorkeling, speedboats, catamarans, kayaks, and even helicopters. You’ll never get tired of exploring this paradise. And the icing on the cake - the rich history and culture of these islands are endlessly fascinating. Every hotel is a collection of thatched, over-water bungalows to make your stay here even dreamier. I’ve seen a lot of beautiful beaches in my travels, but Bora Bora was other-worldly.